Ca. 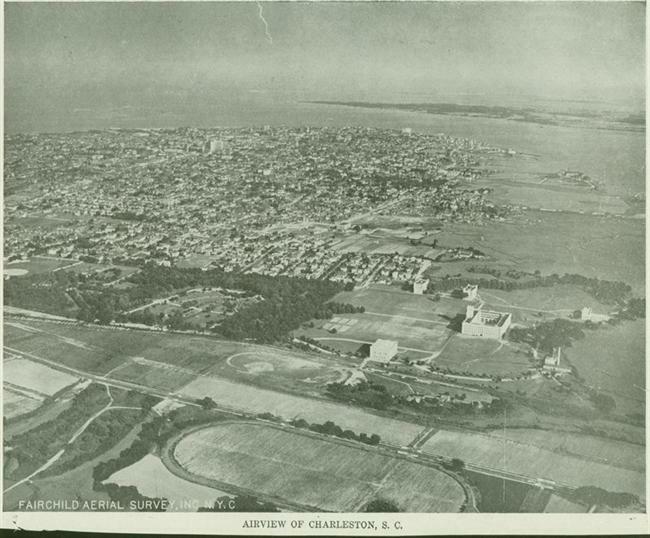 1923 view of Wagener’s racetrack and The Citadel’s new campus. In 1883, F. W. Wagener organized the Charleston Driving Association. Then about fifty years old, Captain Frederick Wilhelm Wagener was a Confederate veteran, successful wholesale grocer, and owner of the Pine Forest Inn in Summerville. Fine carriage horses were his passion, and he indulged it by laying out a half-mile racetrack on the grounds of Rose's Farm [Lowndes Grove] which he had purchased in 1881. February, 1882, saw the last "Race Week" at the nearly century-old Washington Race Course, a one-mile track for thoroughbred runners just south of Wagener's farm. 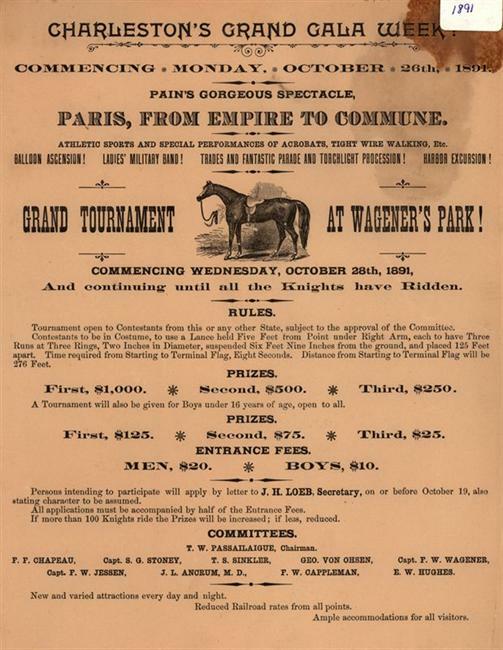 In February 1883, the Driving Association held its first races at "Wagener Park," where more than thirty-five horses from seventeen stables were accommodated in paddocks and sheds. That first three-day meet featured a variety of events: half-mile and three-quarter mile races with jockeys, and one-mile harness races for trotting horses. The third day saw a "saddle horse" race, a half-mile dash reserved for mounts which were in regular use as riding horses. 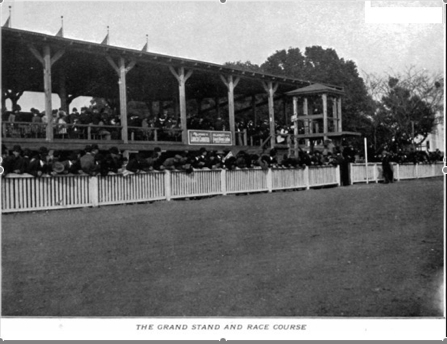 By Thanksgiving weekend of 1883, the track and grandstands were still under construction, but the stable buildings were in good order. At a one-day meet exclusively for harness horses, the setting of the new course garnered praise from local sportsmen as well as visitors. A few months later, the enterprise was deemed a complete success. In January, 1884, more than four hundred spectators enjoyed a full afternoon of racing. The News and Courier's reporter praised the decorous management of the event; because "the sale of liquor and gambling being prohibited on the grounds, and perfect order being preserved, there was nothing to offend the tastes of the most fastidious." Such fastidiousness was soon discarded, and organized betting returned to the racetrack, following a tradition established before the American Revolution. Proper Charlestonians laid their bets side-by-side with strangers of questionble character at the meet in late February 1886. The excitement was heightened by the return of thoroughbred racing, directed by officers of the South Carolina Jockey Club. This attempt to revitalize the racing circuit in the Lowcountry was short-lived. After the earthquake of August, 1886, there were no races at all for several seasons. The Driving Association racecourse eventually reopened, and articles in the News and Courier from February and March, 1897, summarize three afternoons at the races in late-nineteenth century Charleston. The grandstand was full, the track was good and hard, and the "horsemen of the city were more than enthusiastic." As had been the case before the earthquake, the racing cards were mixed: half-mile dash under saddle; trotters and pacers in heats, best two of five; then running under saddle again, three quarter-mile heats. Charleston horses were heavily favored in the wagering pools for all races, and generally rewarded their backers. After F. W. Wagener turned his farm over to the South Carolina Inter-State and West Indian Exposition in 1900, "Wagener Driving Park" became part of the exposition's landscape plan and entertainment programming. In 1917, Captain Wagener sold Lowndes Grove to James Sottile. 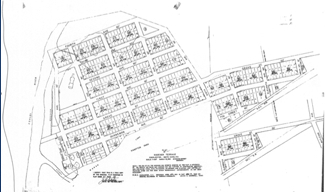 Settling his family into the late-nineteenth century residence overlooking the Ashley River, Sotille sold most of the property as individual building lots in his new Wagener Terrace subdivision. "The Charleston Driving Association." News and Courier, November 30, 1883. "The Close of the Races." News and Courier, March 2, 1886. Harness Racing Museum Library, Goshen, New York. "Last Day of the Races." News and Courier, March 1, 1897. "Our Trotting Park." News and Courier, January 2, 1884. "The Races Today." News and Courier, February 24, 1883. "Racing at Wagener's Park. The Charleston Driving Association's Meet." News and Courier, February 25, 1897. "Short Story of the South Carolina Inter-State and West Indian Exposition." City of Charleston Yearbook 1902. "The Wagener Park Meeting." News and Courier, February 25, 1886. Flat racing on Wagener Racetrack during the Exposition. Grandstand and spectators during the Exposition. Known as Lowndes Grove for its early ownership by William Lowndes, this surburban plantation house was the Woman's Building during the exposition, and home to the James Sotille family after 1917. 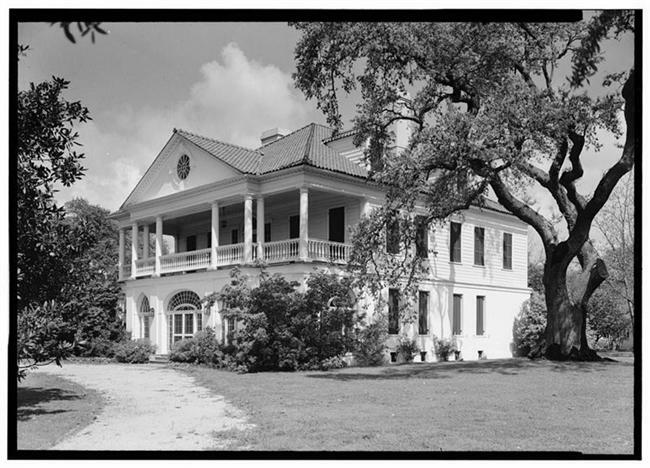 James Sottile bought Lowndes Grove plantation from F. W. Wagener, and subdivided much of the farm as a residential neighborhood.